The 2nd carrier will be called Shandong after Shandong province. A report in Defense News states China is making steady progress on its second aircraft carrier, the Shandong. Under construction near Shanghai, Shandong is set to be China's first domestically produced aircraft carrier and the first to be combat-ready. Previously known as Type 001A, the carrier's official name was recently announced on Shandong province television and radio. Shandong is currently under construction at the Dalian shipyards, where the nation's first aircraft carrier, Lioaning, was converted from a rusting, unfinished ex-Soviet Navy hulk to active duty Chinese Navy ship. 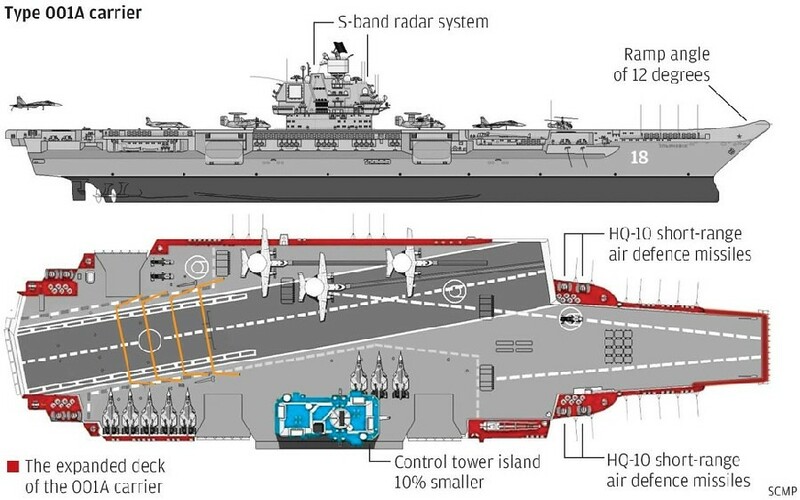 In a rundown on Shandong's construction progress, Defense News says "the new carrier is broadly similar to the Liaoning and retains the ski jump for launching aircraft, but contains a revised flight deck arrangement." The article states the superstructure—the island overseeing the flight deck from where flight operations are controlled—has been mated to the hull and the ship should be launched later this year. "Launching" in warship construction is the floating of a partially constructed hull in water. The ship will still require several more years of fitting out before it can be commissioned into military service and considered ready for combat. Anyone wanna bet that Trumpeter will have a model of this ship ready only months after it's commissioned? CHINA’s first homegrown aircraft carrier is nearing completion. The scaffolding has come off, fresh paint is being applied — and new details are emerging of its design. The ship — dubbed Project 001A, or CV17, is likely to be launched within weeks. Adding to the atmosphere of expectation is a Beijing state-media video ‘infographic’ outlining the modular design and advanced construction of the as yet unnamed aircraft carrier being built in the Chinese port city of Dalian. It reveals that, despite the similarities in appearance, this new ship is a significant improvement over the Soviet design it was reverse-engineered from. 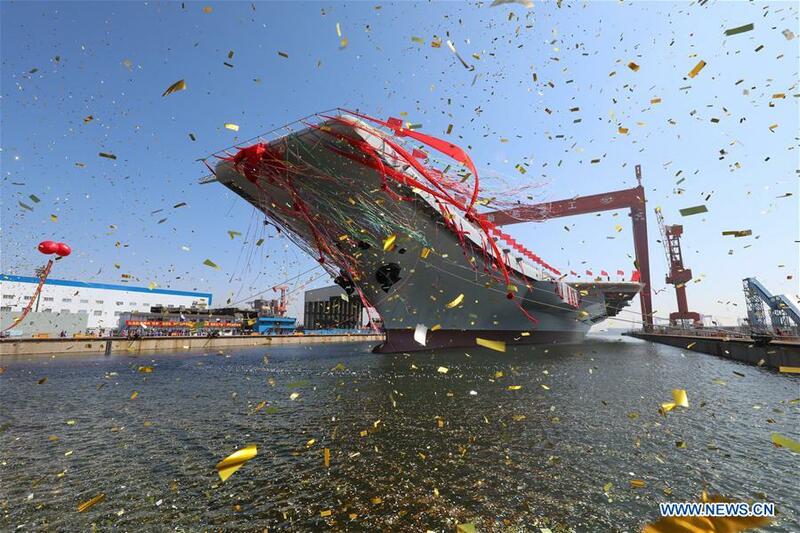 China’s defence ministry has confirmed that the country’s first locally built aircraft carrier has entered its final stage of construction before the hull is launched, which media reports suggest could be as early as April 23, the founding anniversary of the navy. “China’s first home-built aircraft carrier is now being fitted out, everything is going very smoothly,” defence ministry spokesman Wu Qian said on Thursday when asked about the carrier’s upcoming launch. China on Wednesday launched its first domestically built aircraft carrier, which will join an existing one bought second-hand, amid rising tensions over North Korea and worries about Beijing's assertiveness in the South China Sea. State media has quoted military experts as saying the carrier, designed in China and built in the northeast port of Dalian, is not expected to enter service until 2020, as it will take time to fully kit out and arm. The launch had been well-flagged as foreign military analysts and Chinese media have for months published satellite images, photographs and news stories about the second carrier's development. China confirmed its existence in late 2015. The carrier's hull is fully constructed, the official Xinhua news agency said, adding that the propulsion, power and other main systems are in place. Party time in Dalian from the looks of it. Would like to see it side by side with the other one for comparison. Would like to see it side by side with the other one for comparison. The island is certainly more modern looking. The construction of the People's Liberation Army Navy (PLAN) second aircraft carrier (the first built indigenously in China) is progressing at a good pace and is now ahead of schedule according to the program director. The information was revealed in an interview conducted by Chinese national television CCTV. The vessel was launched in April this year. A photo showing the interior of the hangar of Type 001A, China's second aircraft carrier, was released on the public account of China Shipbuilding Industry Corp, the shipbuilder, on Nov. 8 2017. Type 001A was launched in April this year and is domestically built by China. It is the first time the interior of the carrier's hanger was seen since it was launched in Dalian, Liaoning province, on April 26. The ship is China's second aircraft carrier and the first one designed and made at home. The carrier, whose name remains unknown, is the largest and most sophisticated surface vessel China has ever built. It has a displacement of 50,000 metric tons, with a conventional propulsion system. It will carry domestically developed J-15 fighter jets. According to the PLA Daily, CV17 Shandong is expected to start blue-water trials soon. Judging from Grangbin's photos below, it is likely to be the case. Global Times is reporting that China’s second aircraft carrier is about to go for its first sea trials. A military analyst told the publication that the ship is likely to commence testing next month as the PLAN celebrates its founding on Apr. 23. HONG KONG - China's first home-built aircraft carrier will take to sea later this month (April) in her maiden sea voyage designed to coincide with the founding of the People's Liberation Army (PLA) Navy, reported South China Morning Post. CHINA’S ambitions in the South China Sea have suffered a setback after its first home-built aircraft carrier appears to be in crisis. But it was returned to dry dock immediately after its first voyage to sea. It indicates technical issues requiring extensive work. China’s state-run media has been silent on the issue for the past month. But, now, the manager of the Type 001A construction project has been jailed.